Denver—July 25, 2018—Rocky Mountain CARES (RMC) has kicked off a mobile HIV prevention program. 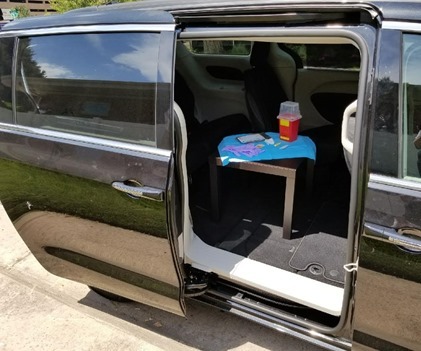 In an effort to increase HIV testing and PrEP (pre-exposure prophylaxis) access, RMC recently purchased a van that is specially-outfitted for the Prevention Program. The mobile program will provide HIV testing, prevention counseling and education, and PrEP consultations and navigation. Pre-Exposure Prophylaxis, or PrEP, is an HIV prevention strategy for people who are at high risk for HIV. People using PrEP take a single pill every day, which is up to 90 percent effective at preventing them from becoming HIV-positive. In Colorado, there are excellent programs to help cover the cost of PrEP for individuals without insurance or with high copays or deductibles. RMC Merged with ARCW in 2017. ARCW is home to the HIV Medical Center – Wisconsin’s largest and fastest growing HIV healthcare system. Through its nationally-renowned HIV Medical Home, including integrated medical, dental and mental health clinics along with its pharmacy and dedicated social services including food pantries, a legal program, housing support and social work case management, more than 5,000 HIV patients in Wisconsin receive the healthcare and social services they need for long-term survival with HIV disease from ARCW. ARCW is also a leading provider of prevention and testing services for people most at-risk for HIV, hepatitis C, sexually-transmitted infections, and opioid overdose, delivering more than 160,000 interventions annually.